The love that people have for their first car is palpable. People give their cars names, almost die in them multiple times, and experience countless milestones in them. I came to own him because my uncle had to move, and he had been sitting in my uncle’s field waiting to get fixed up and driven back and forth to work. But, when my uncle moved, he didn’t have space to keep a project car. So, he called Daddy, and brought him over on a flatbed trailer. I was so excited when he pulled up with this little, red car. I remembered my cousins driving him, and felt like a complete grown-up. Somewhere in there, he earned the name “The Brave Little Toaster” or “BLT” for short. His maroon color reminded me of the children’s cartoon by the same name, and his heater was HOT. He didn’t have a conditional air conditioner, but had a “4-60” according to Daddy, which means four windows down going sixty miles an hour. He also ran when he shouldn’t have. There were mice living in the car for the first year I owned it. I think he released more than one mouse into the basement of my parent’s house in his first year as mine (sorry, family). He smelled like wet dog and gasoline. Every time you turned on the blower, pieces of leaves came out of the vents. And you smelled like wet dog for the entire day. (Daddy took the dash apart and we vacuumed the leaves out of the vents. More than once. It was gross.) My friends (and their parents) usually preferred that we took their cars when we went somewhere together. The BLT was my buddy. We went to work together, and we went to school together. Towards the end of my high school career, he took me to countless college visits. I remember pulling up to a big, fancy, expensive college in him, and seeing countless sports cars in the parking lot. We didn’t fit in, and I was okay with that. Eventually, we settled on Berea College. But, the BLT wasn’t allowed to go to college with me for the first two years (no cars for first and second years), so Daddy took care of him for me and drove him so that he didn’t quit working. My third year of college, I met a cute boy who I eventually wanted to take home to meet my parents. The BLT took us. I drove, and the cute boy slept almost all the way there because he was so nervous. The BLT took us on dates, and eventually took the cute boy back up to Mom and Dad’s so that he could talk to Daddy about marrying me. Then the BLT took us to the nearest city to look at shiny rings, and he took us to the waterfall where the cute boy became my fiancé. He took us to our wedding, and then our honeymoon. We almost died on the way there because of a huge downpour, weak headlights, and no streetlights. It rained so hard, the paint my twin had used to label the car as “Just Married” was washed off. My little car took me to my first real job interview. To doctor’s appointments when my gallbladder quit working. He took Husband-Man to classes and internships. He was a major part of our lives. But, the BLT wasn’t safe to drive everywhere. He was rusty. If someone hit him, and I mean even just a little bit, he would have crumbled. He worked well when we had him. But, Husband-Man and I drive more now that we’re both gainfully employed. We need to be able to drive long distances, especially on the interstate. The BLT was banned from the interstate. The big trucks didn’t see him well enough, and I don’t think he would have done enough damage to them if they’d hit him for the truckers to notice him too much. The BLT had an exhaust leak too. Into the cabin of the car. In summer time, that wasn’t such a big deal because you had to drive him with the windows down anyway because it was so hot. But, with cold weather coming in the next few months, we knew that we couldn’t keep driving him safely with the windows down. And, when I got a job in another town, we knew that the BLT needed replaced. And we found another car. A beautiful 2013 Corolla. Great gas mileage, and even better safety ratings. And we started looking for a new home for the BLT. And we found one, much sooner than we expected. That’s not my story to tell, but it’s a perfect fit. How it all worked out was an answer to our prayers and to other’s. I have a million memories in that car, and it makes me happy that his career isn’t quite over yet. I so look forward to reading your stories. I think our first car stories also wind up being how we came of age. And I wrote a post! Thanks so much, Victoria! I loved it! Steve, I’m so glad that you enjoyed this! 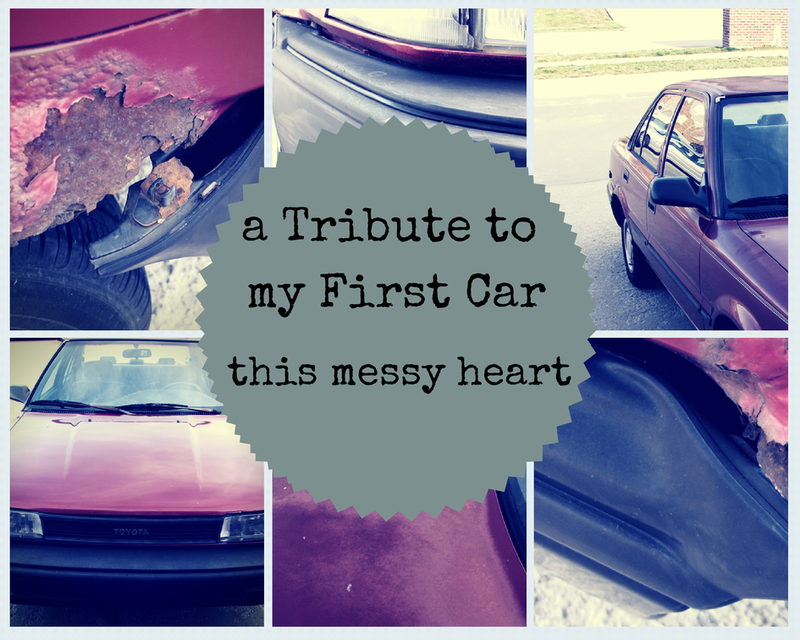 I read your story, and it sounds like your first car had quite a bit of personality! Sarah, thank do much for stopping by! I appreciate it so much! Reading your story, is such a blessing to find a good reliable car at the right price. Carla I loved your brave little toaster simply because you loved him so much!! I never really had “my own” car until the avalon that the old lady sold us because she felt like I was unsafe in Brian’s 😉 … Brian has told me lots of times about his first car that spent more time dead in a field than being driven. Like you said, “The love that people have for their first car is palpable.” Well said, friend, well said. I loved that car. And I still do. It’s not going to the junk yard, so I think I’m okay with where he wound up. That Avalon is a pretty cool car. And has a great story. Thanks for sharing your story, Catherine!